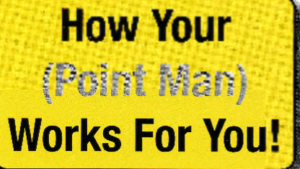 IS YOUR ADVISOR A POINT MAN OR JUST ANOTHER GUY SELLING FINANCIAL PRODUCTS? WHO IS ON YOUR ADVISORY TEAM? If you have to sit and think about that for a minute it’s probably because, like most people, you DON’T have one. Instead you have a group of individuals of whom you go to when you need advice or have a question in their area of expertise. You may work with a CPA to help reduce taxes or to find tax shelters for your various investments. You may have an attorney for trusts, elder care, and final estate decisions. You probably even have a stockbroker or even a financial advisor that may give you advice on what he/she thinks the market is going to do and advice on which investments you should pursue. Maybe you receive advice from your neighbor, pastor, or a son-in-law who reads a lot of articles on the internet. With so much information available at your fingertips, the more important question becomes — How do you sort through everything and get your entire financial portfolio to work in unison? Is there anyone on your advisory team who coordinates all of the advice and information you receive to ensure that it is accurate, integrated and suitable for your situation? Unfortunately for most retirees, that can be the difference in having a viable and sustainable retirement and estate plan, versus flipping a coin and hoping for the best. It’s essential to understand that your financial health is dependent on all aspects working together towards a common goal. Financial advisors must work with CPAs and attorneys to determine whether certain investments make sense from a tax AND legal standpoint, in addition to providing a great financial benefit. It’s great if you can make a 10% ROI (Return on Investment), but if you’re responsible for paying 40% or more of that in taxes because that investment wasn’t properly aligned with the rest of your portfolio… How well did you really do? Likewise, if a layer protects your estate with a particular trust vehicle, but doesn’t understand the complexities of certain qualified or nonqualified retirement plans, you could end up spinning your wheels for years at the cost of thousands upon thousands of dollars. All the financial professionals you work with have one thing in common — YOU! Therefore it only makes sense for all of them to be working together for YOU! VA accredited claims agents and attorneys. They all work together in a coordinated effort to ensure the best possible results for you the client. At the head of your professional team stands your advisor (or point man): your liaison to financial health. In addition to tailored advice, you need a coordinator (or point man) to orchestrate all aspects of your financial plan. He/she should understand how retirement products and strategies interact and be willing to work with members of your advisory team to achieve consensus and unity. At Commonwealth Insurance Advisors, your (point man) will ensure that each team member is aligned with all the strategic initiatives and successfully implements his/ her part of the overall plan. As an integral part of our service, we provide availability at no cost to you with each prospective team member. We will also make sure you receive adequate answers and that you feel comfortable that each team member is a trustworthy fiduciary willing to work with the rest of the team on your behalf. The most important thing we do at Commonwealth is to educate you, as our client. You make the ultimate decision when it comes to your financial future so we maintain the importance of you fully understanding these decisions, including all benefits and consequences associated with them. Our advisors, having many years of experience, are able to discuss and help you formulate a plan of action over the course of several detailed meetings. Once a plan is developed, our entire advisory team is brought in to carry out and execute all the specifics of what you, our client, have set forth.